What do your desk drawers look like? Is it a collection of office supplies, take-out menus, post-it notes and ink pens in every size, shape and color? Does it look like the paper clip box exploded everywhere? The office is no place to create a junk drawer. If you want to increase your productivity, searching around in your drawer for one of those loose paper clips is not going to help. When the boss asks to use your staple remover, you want to be able to retrieve it in seconds. With an organized desk drawer, you can! Store away extra office supplies and keep them out of your drawer. You don't need an entire box of staples or a bag of rubber bands filling up your drawer. Move them! 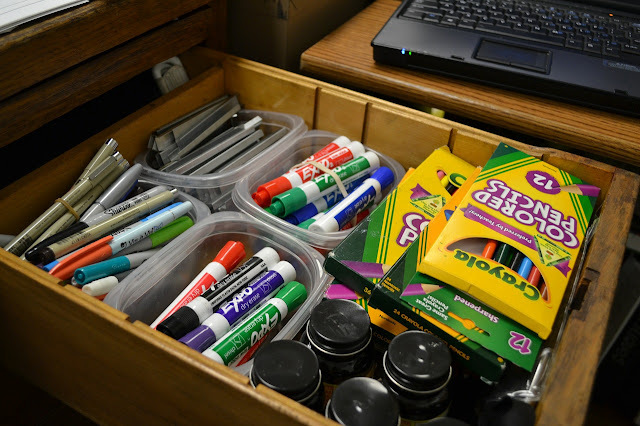 Dump the entire contents of your desk drawer out and sort through everything - pens, pencils, paper scraps, etc. Decide what you would like to keep from the pile. While you are going through your pile, think about what you would like to keep in your desk drawers that you plan to buy. That way, you can create a storage space for it. Drawer bins are wonderful for organizing drawers! They come in various lengths and depths so you can mix and match them for a perfect fit and a place for everything. Drawer bins are inexpensive, however, you could also create drawer compartments by using small boxes, empty egg cartons, yogurt cups or ice cube trays. If drawer bins don't quite work for you, customized drawer dividers may be your solution. They can be cut to fit your drawers to your specifications. Place labels on the bottom of drawer compartments. For instance, label the scissors compartment with "scissors" and the the calculator compartment with "calculator". Although you will quickly learn where to put things, the labels will help someone else put your stuff back where it belongs once they've finished borrowing it. If you have a drawer large enough for files, you may want to fill it with only the files you refer to often. If you don't need the drawer for files, you could use this drawer to hold a few empty folders so you don't have to keep running to the supply closet to get some. You could keep a supply of paper towels and a bottle of cleaner so keeping your desktop wiped off is quick and easy. Some snacks could be kept in the drawer so you don't have to jump up to run to the vending machine. If you have limited drawer space, pull as much as you can out of the drawer and store it on your desk. Pens, pencils, rulers and scissors can all be stored in a pencil cup. It won't take much space and it will free up an amazing amount of storage area in your drawer. If you have no drawers in your desk, a desktop organizer with multiple compartments may be your best bet. You could also get a drawer system that fits beneath your existing desk. Some have both shallow and deep drawers so you can store smaller supplies as well as large hanging files.